Still, the biggest part of the costs is associated with the kitchen island and a countertop that it’s paired with. Most outdoor kitchens have some level of counter space and an area for a refrigerator. It’s recommended for homeowners to build at least a 9 x 3 ft. structure, which costs about $7,500. This island size should hold a couple of cabinets, a refrigerator, a sink and even a side burner. The most common materials used for outdoor countertops are quartz and granite, each costing $75 per sq. ft. Stone slabs also look great and the price is similar. Once you are done with the countertops and cabinets, you have to think about gas lines, electricity and pipes. Homeowners might spend between $700 and $1,000 for the installation of a gas line. Electrical and plumbing lines cost at least $800 to install. 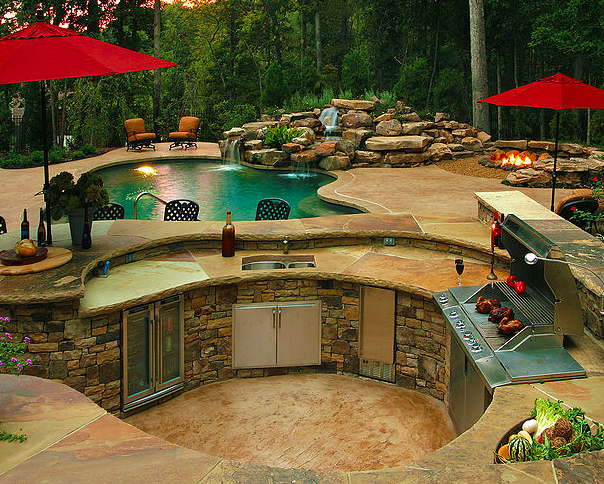 Now that we shed some light on the costs involved in building an outdoor kitchen, let us show you some awesome designs. This is a low cost design of a kitchen island. The stone gives it a rough natural appearance. The island might seem a bit small but you can see it can provide two countertops for food prepping, a sink and a stainless steel grill. The pillars you see in the image provide support for a cover meant to ensure shade over the cooking area. It’s probably a pergola because there’s no reason why you’d make such thick pillars to support a simple plastic cover. The island has the shape of a wide C to save space and to enhance functionality. One could add a few flower pots on the top ledge to improve the appearance of the design. Stucco is a durable, weather-resistant material that provides a smooth finish to this L-shaped kitchen island. Stainless steel is mixed with the elegant brown of the countertops and white paint of the walls. The small side of the “L” is meant for food prepping while the long side contains the grill, the sink, the smoker and a side burner. You can also see double-doored built in cabinets and probably an oven between the two. Considering the above average size of this island, expect to pay more. This L-shaped outdoor kitchen island is full of stainless steel. There is a lot of storage space and you can even see a couple of chairs on the other side of the island so that people can eat on the upper countertop surface. The short side of the “L” is occupied entirely by a big stainless steel grill, while the other part holds all the cabinets, the sink, a side burner and generous countertop space. The countertops are glossy just like the stainless steel. This outdoor kitchen is covered thus being protected from the rain and direct sun rays. Not only does this make it easier for the cook to use the kitchen, but it also reduces weather related damage to the floor, the countertops and appliances. 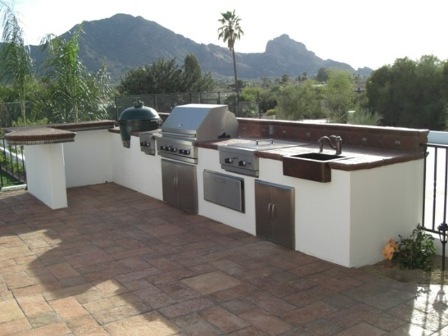 This outdoor kitchen has a U shape thus providing plenty of space for food prepping and a proper seating area. This saves you from buying extra patio furniture to enjoy a meal outside. Natural stone makes the walls of the island being contrasted by the stainless steel appearance of the cabinets doors. The design includes a grill and a sink, as well as a burner. Some might say there’s too much free countertop space but that’s a side effect of ensuring a proper length to accommodate 3 chairs. The high deck is an awesome addition to any house because it allows you to use the space beneath it as well as the one on top. 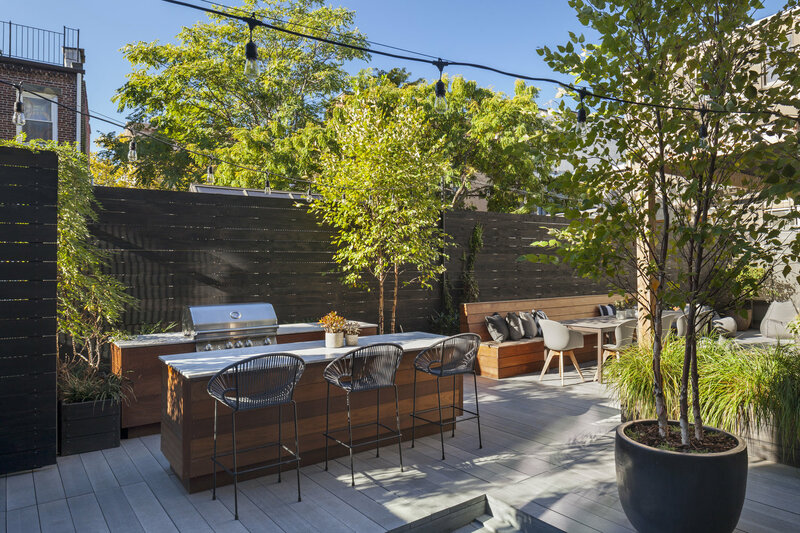 This family opted to add patio furniture at the top floor and turn the covered patio area into an outdoor kitchen with both bar seating and a table surrounded by chairs for dinners with more people. The kitchen island is quite small but it manages to encompass a grill, a sink and plenty of countertop space for food prepping. Light might be a problem because it looks quite dark under the deck but you can also look at it as a perfect shelter against the hot sun. Brick was used for the kitchen island walls to match the house exterior. This design is perfect for those who don’t have a lot of space available but still want to move freely in their outdoor kitchen. The pergola seems to be doing a good job against the sun and it also makes the design more beautiful. It’s true the wall to the right helps in providing shade too. The pergola was also useful to hang a ceiling fan that will make your life so much more comfortable during hot days. The kitchen contains a sink, a couple of cabinets and a grill. The walls have a stone finish whose color goes well with the wooden pergola. The countertops are glossy and have a warm color that matches the stone of the walls. Here’s a spacious outdoor kitchen with a V shaped island and an extra central piece for seating that can accommodate at least 3 people. The grill is quite big and there are a lot of cabinets for extra storage. You can basically move your indoor kitchen outside in the summer and you won’t have to step foot inside when you cook. Still, I can’t see a refrigerator in the image but it could be a built-in mini-fridge behind one of those stainless steel doors. Apart from the grill and the sink, no other appliances can be seen, so you might want to add some because all that extra counter space seems like a waste. This design looks fabulous and it’s obvious it belongs in the yard of a million dollar modern house. The double tops provide plenty of space for eating (the top level) and food prepping (the lower level). The grill has a generous size and you can see a built-in refrigerator with a stainless steel door. There are a few cabinets for storing the most important kitchen utensils. The curved layout softens the stone used for the countertops and walls. Besides, it goes well with the free form pool and the rocky waterfall you see near the kitchen. This wide-V shaped kitchen island holds a sink, a grill and a burner as well as a round part for eating and several cabinets with stainless steel doors. The walls are covered in very small square tiles of different shades to match the multi-colored cobblestone patio. Electrical lines have been installed, hence the turned on lamps that create a cozy atmosphere in the evening. Half the kitchen is covered by what seems to be a huge reed umbrella thus making you feel like you cook on the sunny beaches of Jamaica. While you can barely call this a kitchen due to its small size, you have to admit the design is cute and smart. The countertops are lined with blue tiles to match the pool water. Although there isn’t virtually any storage space, the kitchen still has enough room for a side burner, a grill and a small sink while leaving a big enough countertop surface for food prepping. This is perfect for grill pool parties and for moms who want to supervise their children swimming in the pool while preparing dinner. It’s true you’ll have to move back and forth between the house and the outdoor kitchen but no design is perfect. This outdoor kitchen design is very simple and straight forward: two countertop pieces facing one another. They have the same length. One is meant to hold the grill and provide food prepping space while the other serves as eating space. It’s hard to tell if there is any storage space. This could be a drawback but it’s a design suitable for those who don’t have much space available and still want to cook outside. This outdoor kitchen looks like a bar. You can almost imagine the bartender on the other side of the counter preparing a delicious margarita. The recline windows are an interesting feature of this design because you can basically turn the kitchen into an indoor one as you please. 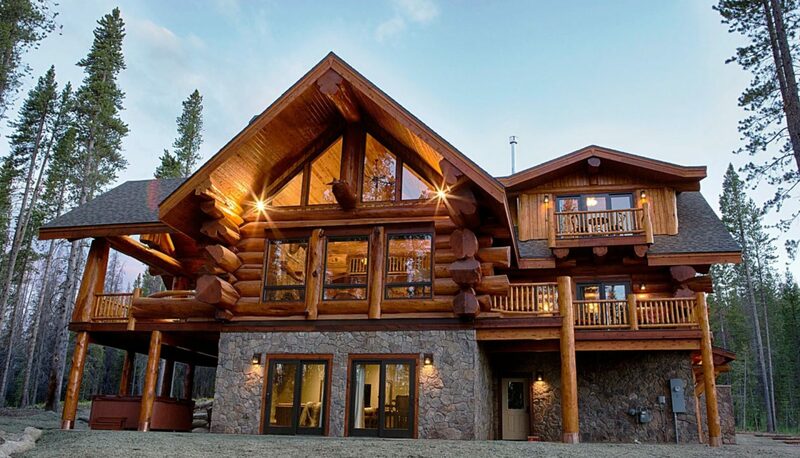 The wooden finish matches the look of this cabin and provides a rustic appearance. You can’t see much about the appliances and the countertops, but one can assume the countertops are laid out in an L-shape. There is no grill though, but honestly, you can’t put one in a fully covered kitchen like this one. At a first sight, you can tell what stands out about this design: the oddly shaped kitchen counters. There are several pieces that can be moved around on wheels, so modularity is a great advantage. The white color mixed with the stainless steel creates a modern look. The storage space is decent and you can see several appliances: a big grill, a stove, a built-in mini-fridge and even a beer dispenser. This design belongs in a modern house whose owner tends to throw frequent grill parties near that beautiful vanishing edge pool. Here’s a beautiful curvilinear outdoor kitchen island with beige glossy countertops and stainless steel doors for cabinets and mini-refrigerators. You can even see a side burner and a beer dispenser. There’s also a sink but the grill is missing. You might want to buy a stand alone grill on wheels if you must have one. The color of the countertops matches perfectly with the darker shades of natural stone floor. The spotlights integrated into the island are perfect for cooking after dark. Out of the places to put an outdoor kitchen, someone from Chicago actually built one on the rooftop of a skyscraper. You have to admit this is out of the box thinking. Besides, the kitchen looks amazing. It combines wooden cabinets with black shiny countertops and stainless steel appliances. Add on top of this the amazing view, and you will forget about the hassle of living in an apartment building. The kitchen has a grill, a burner and a sink. This outdoor kitchen uses concrete as a main material. The island has an L shape, the short side providing a place to eat for about 3 people. There’s a grill, a full size refrigerator, a sink and even a beer dispenser. In the middle of the kitchen one can see a big granite table with metal chairs. Add the wooden patio table and seating, and you can hold a dinner party without any problems. The concrete used to build the island is a fairly new element that provides a modern appearance to the entire design. The outdoor kitchen in this photo is located under a structure that provides shade and a support for the hanging lights. The counters are covered in metal sheaths on the outside that contrast with the wooden bar chairs. On the inside, there’s a full stove, a grill and a stainless steel storage piece with shelves. There also are a mini refrigerator and a small freezer to keep beverages cool in the burning sun. The kitchen is located under a structure held by thick concrete pillars on top of which natural stones were applied to create a fancy look. The outside sides of the counters are made of black stone. The countertops are also colored in a dark shade. This contrasts with the inside of the counters that’s made of wood. There are a couple of stainless steel items like the mini-fridge and the huge grill. The kitchen has 2 sinks and a small oven as well as a couple places for storage. Some people might argue that this barely qualifies as a kitchen because there’s no grill, not even a side burner. Still, if you have an open mind and take a closer look, you will notice there is plenty of storage space, a sink and a table with chairs. The beauty of it all is that all of this apart from the table fits in a space the size of a pantry. Besides, you can buy a grill and put it in your yard, it doesn’t have to be enclosed in the kitchen counters. This is perhaps the cheapest outdoor kitchen available out there. It’s not luxurious, but it gets the job done while being small and cute. And last, here’s an outdoor kitchen as part of a beautiful modern house. The black counters offer enough space for a 4-person dinner as long as they don’t mind seating on metal bar chairs. The metal contrasts with the wooden planks that cover the exterior of the counters. You can see that this kitchen has an oven but no grill. There are a sink and a full size stainless steel refrigerator but we can’t tell if any storage space is available.